The memorial to Lieutenant Viscount Wendover in All Saints Church, High Wycombe, Buckinghamshire. 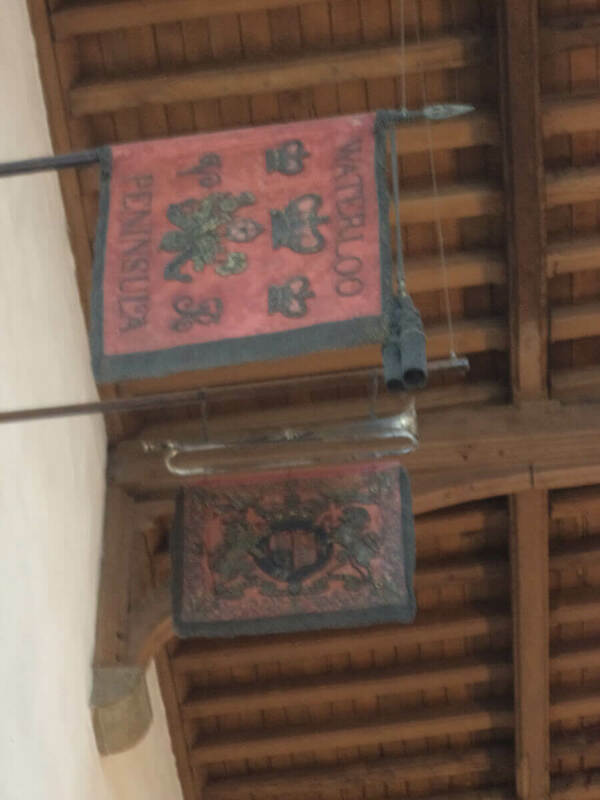 This extraordinary memorial in All Saints is to Lieutenant Viscount Wendover, Royal Horse Guards, mortally wounded at the Second Battle of Ypres during the desperate dismounted attack by the 8th Cavalry Brigade on 13th May 1915 to recover the British trench line, lost to the German advance during a heavy bombardment. Wendover died in Boulogne on 19th May and his body brought home by his family, a practice subsequently banned by the army. The memorial, high up on the east wall of the church, comprises the sword, spurs and heraldic devices of the 20 year old viscount, with a brass plaque. 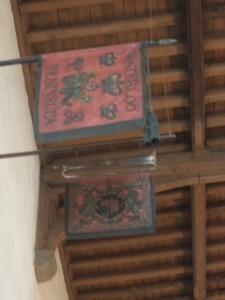 Above these relics are a standard and trumpet with banner of the Blues. It must be unprecedented for a regiment to provide such important artefacts for a memorial. 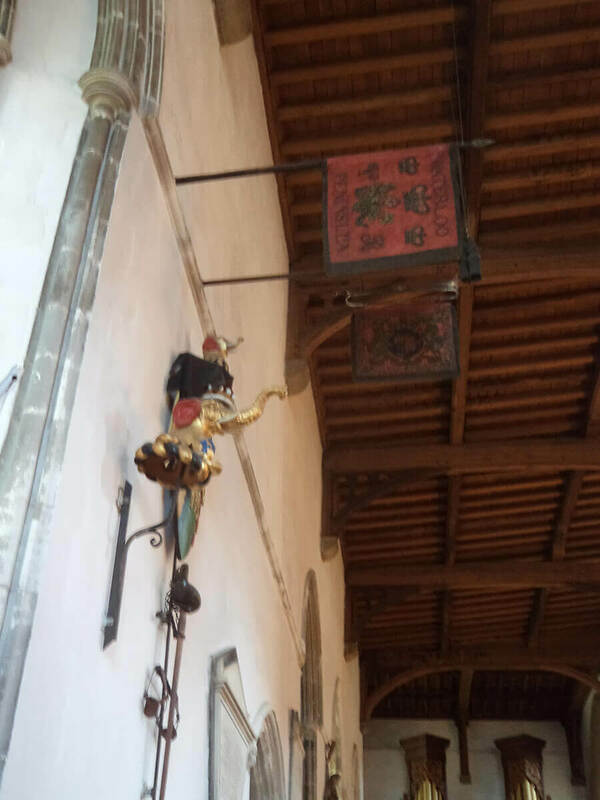 The Royal Horse Guards Standard and Trumpet over the memorial to Lieutenant Viscount Wendover in All Saints Church, High Wycombe, Buckinghamshire. The Royal Horse Guards attacked in the charge on the right of the Essex Yeomanry. Each of the three regiments lost around 10 officers and 150 other ranks in the charge. The commanding officers of the 10th Hussars and the Essex Yeomanry were killed. In All Saints there is also a memorial to a VC from Wycombe Royal Grammar School, Lieutenant Frederick Youens, Durham Light Infantry, killed in 1917. A surprising find in All Saints was a memorial to Captain Edward Kennedy RN, father of Ludovic Kennedy, who rejoined the Royal Navy in 1939 at the age of 60, and was in command of the converted liner HMS Rawalpindi off the Faroes, when Rawalpindi encountered the German battleships Scharnhorst and Gneisenau. Kennedy refused a demand to surrender and fought his ship until it was sunk by shellfire, going down with it.